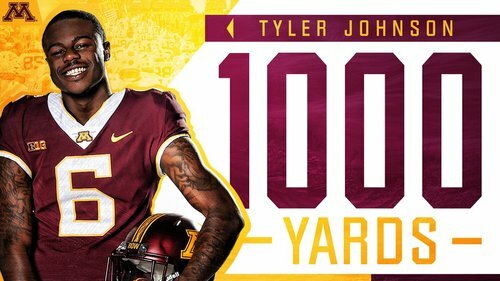 Facing third-and-7 from its 30, Thorson hits JJ Jefferson for 68-yard gain to Gophers 2. Bowser takes it in for a TD. Two-point conversion pass is good, and Wildcats lead 21-7 with 11:07 left in fourth quarter. #Gophers gain 3 yards on third-and-10. Northwestern takes over at its 8 after Herbers punt. End third quarter: Northwestern 13, #Gophers 7. Gophers facing third-and-10 from their 47. Williamson has a career high eight tackles this afternoon including 1.5 for loss, a sack and a pass breakup. 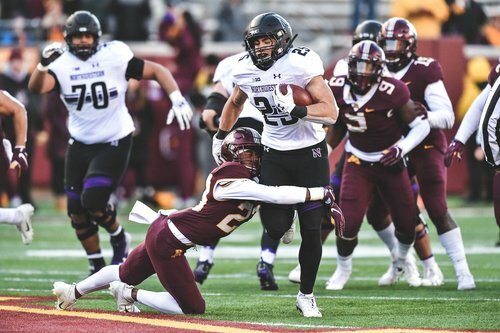 #Gophers force Northwestern to punt. They take over at their 18 after 50-yard punt rolls dead. 2:51 left in third quarter. #Gophers DB Chris Williamson sacks Clayton Thorson on blitz for 9-yard loss. Defense does its thing. Minnesota misses a field goal. 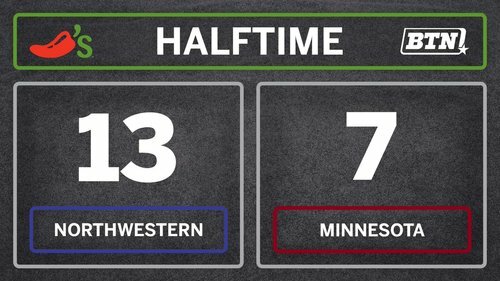 #Gophers drive to Northwestern 19. Mohamed Ibrahim dropped for 1-yard loss on third-and-1. Emmit Carpenter misses wide right on 38-yard field-goal attempt. #Gophers Morgan throws deep for Bateman, but Northwestern's Cam Ruiz interferes. Gophers have it at their 49. Northwestern goes for it on fourth-and-8 from #Gophers 34. Thorson's pass broken up by Coney Durr. Gophers take over. Emmit Carpenter's kickoff goes through end zone. Northwestern starts thrid quarter at its 25. Correction on Tyler Johnson. He surpassed 1,000 receiving yards for season. Halfway home in the Twin Cities. @NUFBFamily leads @GopherFootball by 🖐+☝️. Northwestern gets 23-yard pass play to 32 and a 19-yarder to the #Gophers 13. QB Clayton Thorson then keeps it and runs 13 yards for a TD and 13-7 lead with 1:12 left in the half. Extra point is wide right. Kyric McGowan returns kickoff 39 yards to Wildcats 45. #Gophers Mohamed Ibrahim bulls in from the 1 for a touchdown with 2:18 left in the first half. Emmit Carpenter's extra point ties the score 7-7. On third-and-3 from the Northwestern 31, #Gophers Mo Ibrahim gains 29 yards to the 2. Tyler Johnson snags his fifth grab of the day and is at exactly 1,000 yards receiving for the season! 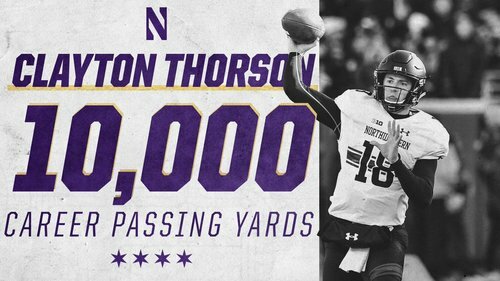 He is just the fifth Gopher to ever record 1K in a single season. #Gophers LB Blake Cashman sacks QB Clayton Thorson for 14-yard loss to Minnesota 48 on fourth-and-6. Gophers take over. Northwestern's regular kicker, Charlie Kuhbander is out because of injury, and punter Jake Collins is the backup kicker. 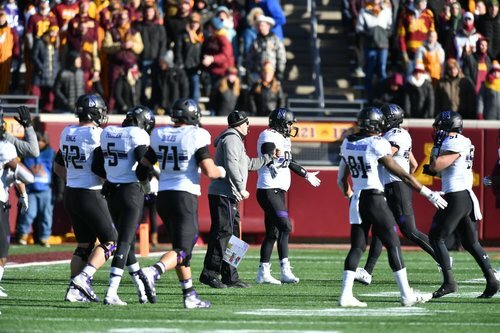 Northwestern, facing fourth-and-6 from #Gophers 24, lines up for play from scrimmage and calls timeout. #Gophers RB Mo Ibrahim gains 4 yards on third-and-5. Gophers go for it and Seth Green is stuffed by Nate Hall for no gain. Refs blow whistle, but pile still was moving. Northwestern gets ball at its 27. Minnesota goes for it on 4th down. #Gophers face third-and-5 from the Northwestern 30. They call timeout.